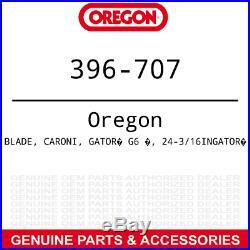 3 Gator G6 Blades Caroni TC710 Finish Grooming Mower w/ 71'' Deck 71001000. Blade Specs: Length - 21.125'' Width - 3'' Thickness. 75'' Offset - 3/4'' Air Lift - 1'. Replaces OEM Part Number: CARONI: 71001000. Fits: Caroni TC710N 71 deck Finish Grooming Mowers. Requires 3 blades for 71 decks. Tungsten carbide is "fused" into the blade - creating an ultra-hard layer at the cutting edge and increasing the time between sharpening. Blade Specs: - Length: 21.125'' - Width: 3'' - Thickness. 75'' - Offset: 3/4'' - Air Lift: 1'. The item "3 Gator G6 Blades Caroni TC710 Finish Grooming Mower with 71'' Deck 71001000" is in sale since Thursday, March 21, 2019.